Figure 5.14 Ball, flattened ball, and flake (disk). Handgun cartridges loaded with cylindrical powder are uncommon in the United States. As a result of animal experiments, it appears that in a .38 Special revolver with a 4-in. barrel, cartridges with flake powder produce powder tattooing out to 18 to 24 in. (45 to 60 cm); cartridges loaded with flattened ball out to 30 to 36 in. (75 to 90 cm), and cartridges loaded with true or spherical powder out to 36 to 42 in. (90 to 105 cm) (Table 5.4).4 In contrast, a .22 caliber rimfire revolver with a 2-in. barrel, firing .22 Long rifle cartridges produces powder tattooing out to 18 to 24 in. (45 to 60 cm) with flake powder and 12 to 18 in. (30 to 45 cm) with ball powder (Table 5.5). aerodynamic form than a flake; thus, ball powder can travel farther retaining more velocity, enabling it to mark the skin at a greater range. In .22 rimfire ammunition, however, flake powder produces tattooing out to a greater distance than ball powder. The explanation is that the individual grains of ball powder used in the .22 ammunition are so fine that any aerodynamic benefit obtained from the shape is lost as a result of its lighter mass. The maximum range at which tattooing occurs, as well as the size and density of the powder tattoo pattern, depends not only on the form of the powder but on a number of other variables, including the barrel length, the caliber, the individual weapon, and the presence of intermediary objects such as hair or clothing that will absorb some or all of the powder grains. The greater the range, the larger and less dense the powder tattoo pattern. 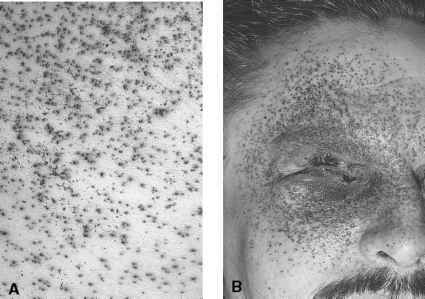 The increase in size of the pattern is due to gradual dispersion of the powder grains, with decreased density of the pattern resulting not only from dispersion but also from rapid loss of velocity of the individual grains; fewer grains reach the target and those that do may not have enough velocity to mark the skin. At close range, a gun with a short barrel will produce a wider and denser tattoo pattern than a longer barrel weapon as more unburned particles of powder will emerge from the short barrel (Figure 5.15). Tattooing will, of course, disappear at a closer range with a short-barreled gun compared with a long-barreled gun. 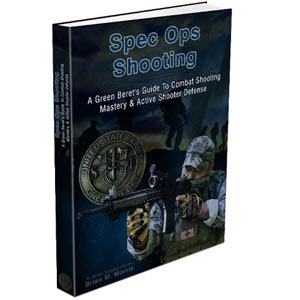 Silencers will filter out a great proportion of the soot and powder particles, thus making the range from muzzle to target appear greater than it actually was. To a degree, hair and clothing prevent powder from reaching the skin. In centerfire cartridges, ball powder readily perforates hair and clothing at close and medium range. In contrast, except at close range, flake powder usually does not produce powder tattooing through clothing or dense hair, as the grains of flake powder have difficulty in perforating these materials. Figure 5.15 Two intermediate-range gunshot wounds (range, 15 cm). Upper tattoo pattern produced by weapon with 6-in. barrel; lower pattern from weapon with 2-in. barrel. The influence of the type of powder on the extent and degree of powder tattooing and blackening was exhibited in a case in which an individual was shot with a .45 automatic loaded with Norma ammunition. Testing revealed that the maximum range of powder tattooing and blackening in this particular weapon with this particular ammunition was only 6 in. Although powder tattooing may extend out to almost four feet with a .38-caliber revolver, individual powder grains can travel much farther. In an experiment using a .38 Special 4-in. barrel revolver firing standard velocity Remington ammunition in which the bullet weighed 158-gr. and the powder was flake, individual flakes of powder were deposited on material out to a maximum of 6 ft. from muzzle to target (Table 5.6).5 A high-velocity Remington cartridge loaded with a 125-gr. semi-jacketed hollow-point bullet and ball powder, discharged from the same weapon, deposited powder grains on a target 20 ft. from the muzzle. An identical cartridge loaded with flake powder deposited powder on clothing out to a maximum of 9 ft. from the muzzle (Table 5.6). Additional tests were carried out with a .357 Magnum revolver having a 4-in. barrel. Cartridges loaded with flattened ball powder deposited grains of powder out to a maximum of 15 ft. Cartridges loaded with flake powder deposited flake powder out to a maximum of 10 ft. (Table 5.6). aHigh-velocity loading; bstandard velocity loading. In view of the fact that powder grains can travel such great distances, the presence of a few unburned grains of powder around an entrance in the skin or clothing does not necessarily indicate an intermediate-range wound but, depending on the individual form of powder, can be produced by a weapon being discharged as much as 15 to 20 ft. from the victim. At these ranges, however, the powder has insufficient velocity to mark the skin. In addition to soot and powder grains, other materials are deposited on the body when a weapon is discharged in close proximity to the body. These materials include: antimony, barium and lead from the primer; copper and zinc (sometimes nickel) vaporized from the cartridge case by the intense heat; fragments of metal stripped from or vaporized from previously fired bullets and deposited in the barrel; copper, aluminum or lead stripped or vaporized from the bullet that was fired; and the grease and oil that had coated the barrel or bullet before discharge. The metallic particles can be detected on the body or on clothing by soft x-ray if they are large enough. Trace metal deposits of these metals can be detected by EDX and SEM-EDX. The appearance of powder tattoo marks on the skin depends on the physical form of the powder. Powder tattoo marks produced by flake and cylindrical powder are irregular in shape, reddish brown in color, and show great variability in size (see Figure 5.13). Such markings are usually relatively sparse compared to tattooing from ball powder. Slit-like tattoo marks due to grains of flake powder striking on their side may be seen. Occasionally, fragments, intact flakes or both will be found lying on the skin. The number of such flakes is relatively small. Flakes can on occasion penetrate into the dermis, in which case they may produce bleeding from these sites. Small blood clots at the points of penetration may give the appearance of a spray of dried blood. The author has seen a few cases involving flake powder where large numbers of flakes were embedded in the epidermis with some penetrating into the dermis. The flakes of powder were found to be very small, very thick yellow-green disks. The tattooing produced by these thick disks very closely resembled the tattooing of ball powder. Differentiation was possible only by observation of the thick disks in the wound. In contrast to flake powder, powder tattooing due to spherical (true) ball powder is considerably more dense with numerous fine, circular, bright red tattoo marks, many containing a ball of unburned powder lodging in the center of the lesion (Figure 5.16A). 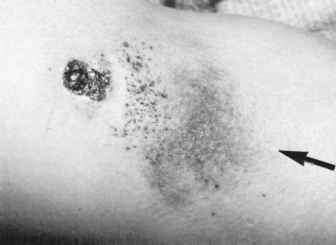 On seeing the powder tattoo marks from spherical ball powder, one is struck immediately by the resemblance to the petechiae of an intravascular coagulation disorder. Attempts at wiping away the ball powder grains are only partly successful, as many if not most of the little balls of powder are deeply embedded in the skin. In powder tattoo patterns due to flattened ball, the number of markings produced is greater than in the case of flake powder but fewer than from ball powder. The individual markings tend to be finer, more uniform and more hemorrhagic than flake, approaching those of ball powder in their appearance (Figure 5.16B). Powder grains are recovered embedded in the skin, but they are not nearly as numerous as in cases of true ball powder tattooing. The previous descriptions of powder tattooing concerned centerfire handguns. Powder tattooing from .22 rimfire cartridges is different. Those cartridges are loaded with either small, thick disks or very fine ball powder (Winchester ammunition). Ball powder produces extremely fine but faint tattooing, whereas flake powder produces a larger, more prominent tattoo pattern. These latter markings more closely resemble those of centerfire flattened ball powder than those of traditional flake powder. In some instances flake or parts of flakes have penetrated into the dermis. Powder tattooing may be present in angled contact wounds. In such wounds, as the angle between the barrel and skin decreases, the gap between the skin and barrel increases. At some point the gap becomes sufficiently large that unburnt grains of powder escaping through the gap will skim over the zone of seared skin, fanning out from the entrance, impacting distal to the entrance wound (see Figure 4.3C). In contrast, if a weapon is discharged at intermediate range with the barrel at an angle to the skin (an angled intermediate wound), dense tattooing is predominantly on the same side of the wound as the gun with scattered tattooing on the opposite side (Figure 5.17). Figure 5.16 Powder tattooing from (A) true ball powder and (B) flattened ball powder. 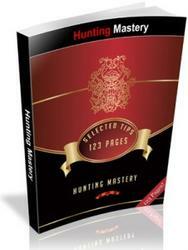 The author has never seen true powder tattooing of the palms of the hands from powder exiting the muzzle of a gun. He has, however, seen numerous cases in which powder grains were embedded in the palm without the vital reaction that gives tattooing its appearance (Figure 4.9; 4.20A). Lack of tattooing in the palms is apparently due to the thicker stratum corneum protecting the dermis from any trauma. The author has seen rare cases where there were what appeared to be four to five powder tattoo marks on the palm. In these cases, the powder would have had to have come out the cylinder gap. Therefore, it is possible that the marks on the palm were not tattoo marks, but stippling due to fragments of lead accompanying the powder out the cylinder gap. The size and density of the powder tattoo pattern on the body around the wound of entrance can be used to determine the range at which the weapon was discharged by replication of this pattern on test material. To do this however, the same weapon, and ammunition identical to that of the fired round, should be used in the testing. Selection of ammunition used for test firings is extremely important because different brands and lots of ammunition contain different powders and quantities of propellant. Therefore, ideally, unfired cartridges recovered from the gun or cartridges that came from the same box of ammunition that the fired ammunition came from should be used in the tests. 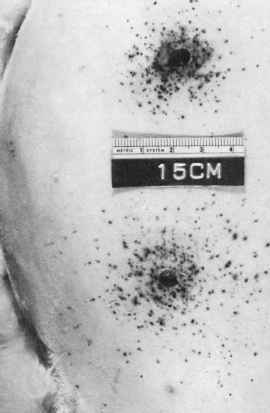 Figure 5.17 Angled intermediate gunshot wound with powder tattooing on side from which the bullet came. Arrow indicates direction of bullet. Muzzle-to-victim range determinations from powder tattoo patterns on the skin are made by Firearms Examiners, using measurements of the tattoo pattern obtained by the pathologist or from photographs. The distance at which a test pattern identical in size and density to the powder tattoo pattern on the body is produced is assumed to be the range at which the gun was fired at the individual. Test patterns generally are produced on white blotting paper. Unfortunately, experiments have shown that powder tattoo patterns on paper are consistent with skin tattoo patterns only up to 18 in. of range.4 At ranges greater than 18 in., there is no correlation between the size and density of the tattoo pattern produced on the body and the pattern produced on blotting paper. Another potential problem with range determinations that are based on the size of powder tattoo patterns is a simple one of variation in measuring. Different individuals measuring the same powder tattoo pattern may produce different measurements.4 This is due to the fact that some individuals measure the whole pattern, whereas others measure the main area of the pattern, excluding occasional "flier" tattoo marks. How to find distance of bullet injury?